Ever wondered what the inner workings of the Friends Feeding Friends Food pantries looks like? Curious about joining our amazing team of volunteers? Wondering what type of resources we have to offer our community? Please JOIN US for a casual evening of community conversation and see our food insecurity efforts to help our Mascoma Valley. 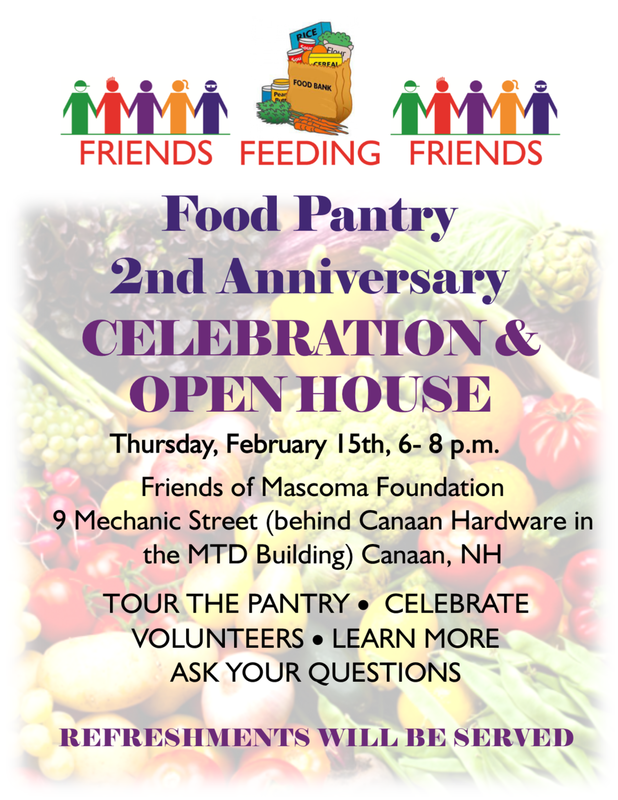 TOUR our Canaan Food Pantry, ASK your questions., CELEBRATE volunteers, and LEARN MORE about what you can do to help access our resources or contribute. Treats and punch will be served throughout the evening and tours will be given regularly. Our first MVRHS intern, Kat, will offer a brief welcome and introductions at about 6:15 followed by CAKE CUTTING. NOCHE MEXICANA FUNDRAISER! Raffles, too!